A prophetic new understanding of God and human spirituality within a larger arena of intelligent life. 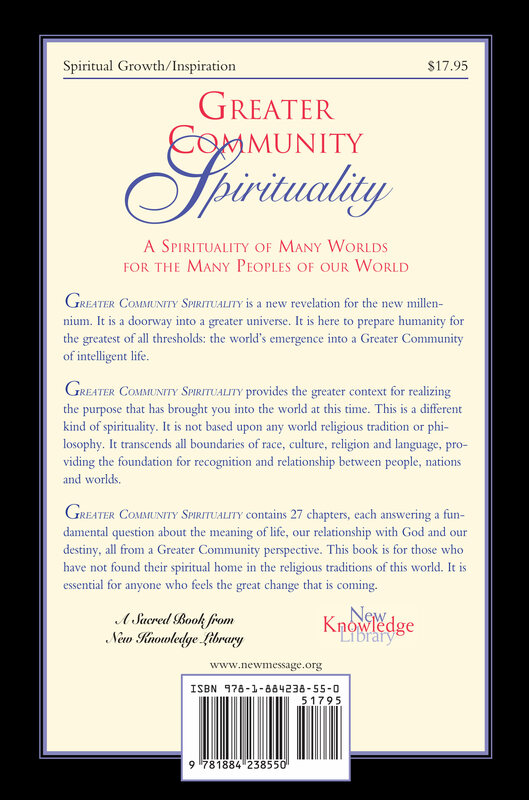 Greater Community Spirituality is a spirituality that transcends all boundaries of race, culture, religion and language, providing the foundation for recognition and relationship between people, nations and worlds. GREATER COMMUNITY SPIRITUALITY is the New Message book of theology. It opens the way to a greater experience of God. This Message has never been presented in the world before and is not based upon any existing world religious tradition or philosophy. It is a new theology to prepare the human family for the great thresholds ahead. It is a doorway into a greater universe. Chapter 1 - What is God? Chapter 4 - What is Knowledge? Note: This product is delivered as a zip file containing a pdf, a mobi (kindle) and an epub file (other ereaders), along with a brief 'Getting Started' intro. Please refer to your Confirmation Receipt email for your download link. The Free School is a global community of people studying the New Message from God and sharing it with others. The School offers an environment of individual study, study partnerships, international gatherings, broadcast events and community interaction to deepen our experience of the New Message and connect us with others around the world. How would you rate this book/cd/event?